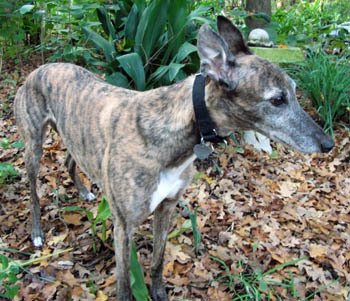 Ashton, aka Whistler's Twig, is a beautiful 9½-year-old brindle female born March 8, 2003. Her sire is Craigie Whistler, making her grand sire Molotov, and her dam is Coastalcaribbean. 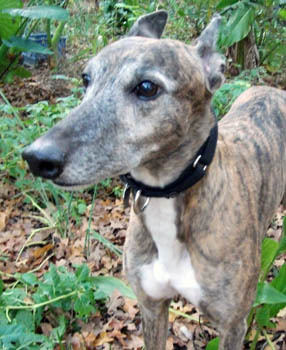 Ashton's racing career was only 3 races all in November 2004 at Derby Lane in Florida. She is well mannered and very loving. 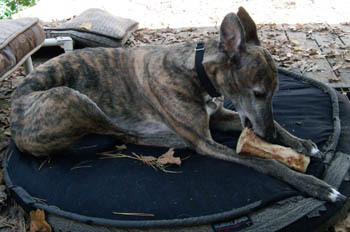 Ashton has been in an adoptive home for seven years, but has returned to GALT to resume her search for a forever home. She will be happiest in a home without very small children to make her nervous. 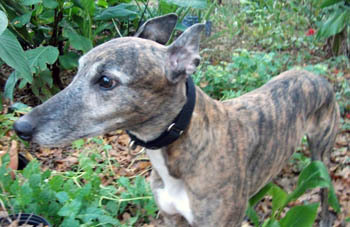 Ashton is cat trainable, but needs some refresher time in a foster home with cats.